How do you plot points on coordinate graph? We draw co-ordinate axes X'OX, extended ‘side-by side’ and Y'OY, extended ‘above and below’ and take x-axis and y-axis respectively. Then we have to decide how any sides of the small square may be taken as one unit such that one centimeter represents one unit on both the axes. According to that unit and sign of abscissa and ordinate, the location of the point is found. 1. Plot point P(2, 4) on the graph. 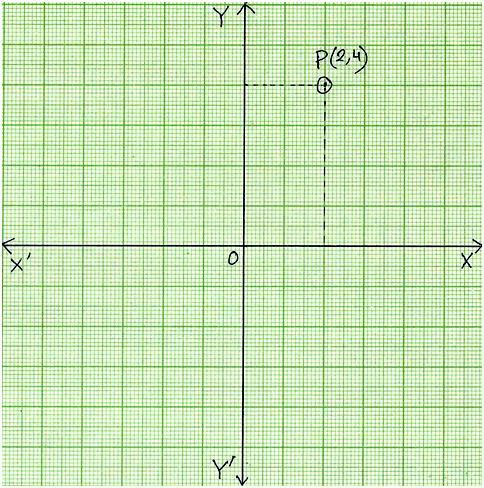 On the graph paper X'OX and Y'OY are indicated as x-axis and y-axis respectively. Length of one sides of the square (i.e. 1 div) is taken as unit. In point P(2, 4) we observe that both the co-ordinates are positive so they will lie in the first quadrant. Count 2 units along x-axis to the right of origin. Draw a line BA ┴ XOX'. Now, count 4 units along y-axis upward. Draw line CD ┴ YOY'. Both these lines intersect at point P.
Therefore, the co-ordinates of point P are (2, 4). 2. Plot point M(-5, -3) on the graph. In point M(-5, -3) we observe that both the co-ordinates i.e. abscissa (-5) and ordinate (-3) are negative so they will lie in the third quadrant. Count 5 units along x-axis to the left of origin. Draw a line QP ┴ X'OX. Now, count 3 units along y-axis downward. Draw line RS ┴ Y'OY. Both these lines intersect at point M.
Therefore, the co-ordinates of point M are (-5, -3). Any point on x-axis: The co-ordinates of any point on the x-axis are of the form (x, 0). 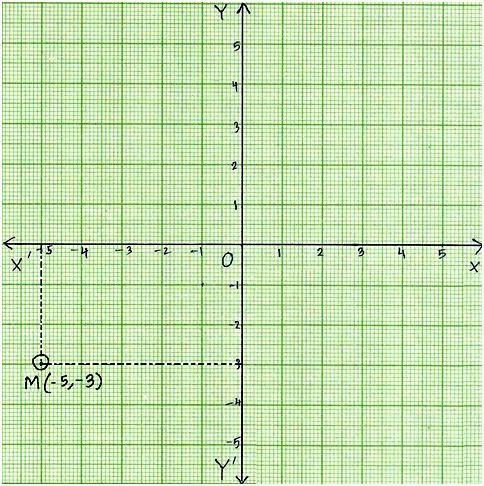 Therefore the y co-ordinate of every point on x axis is zero. For example: (2, 0), (7, 0), (5, 0), (-2, 0), (-7, 0), (-2, 0) are the points which lie on x –axis. Any point on y-axis: The co-ordinates of any point on the y-axis are of the form (0, y). Therefore the x co-ordinate of every point on y axis is zero. For example: (0, 1), (0, 4), (0, 6), (0, -1), (0, -4), (0, -6) are the points which lie on y-axis.